A White Walker is a humanoid creature from the HBO television series Game of Thrones and the George R. R. Martin novel series A Song of Ice and Fire on which it is based. Primarily referred to as the Others in the novels, White Walkers are a supernatural threat to mankind who dwell north of The Wall in Westeros. The Verge named them among "the most visually iconic creatures on the show". 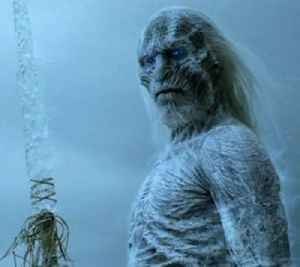 White Walkers are also featured in the show's merchandising.